Koster 21- is a water based (solvent free), highly heat reflectivity cementitous waterproofing membrane. It is a multi-purpose liquid waterproofing for masonry, concrete, metal, PVC and etc. 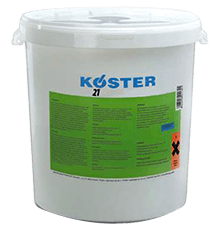 KÖSTER 21 means for "waterproofing in the 21st century" where the material has consolidates many advantages among the range of waterproofing products. KÖSTER 21 was designed to cater the demand of the world market, which expects the excellent quality and sustainable waterproofing products for now and then.